Washington State Stick Flag - 4x6"
Washington state flags are some of the most unique flags in the United States of America. The field's color and the flag's central emblem are both distinct from every other flag in the country, but the design of the Washington state flag manages to retain enough similarities to the others that it can easily be recognized as a state flag. 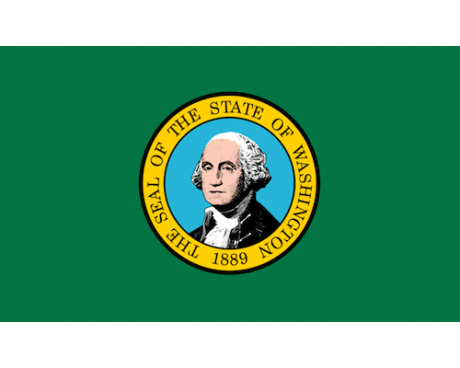 Washington state flags have a dark green field that features the state's seal in the center. The seal displays a simple portrait of George Washington that is surrounded by a gold border which displays the year that Washington was admitted into the United States of America. 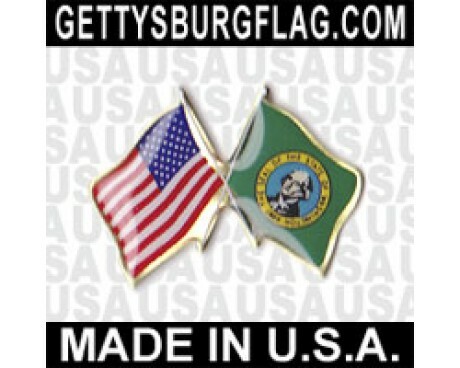 The flag's green field is a symbol of the state of Washington, which is often called the Evergreen State. The state seal emphasizes the state's connection to the rest of the nation by honoring its first president, who also provided the state with its name. 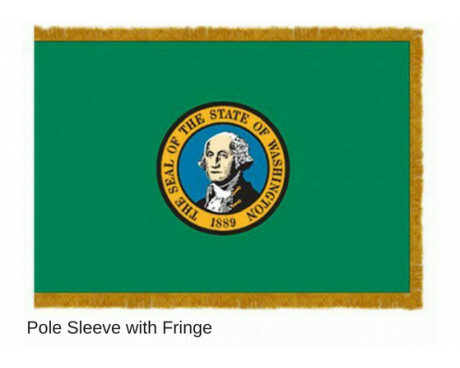 The Washington state flag is the only flag in the United States to include a depiction of a president. The earliest form of the state flag of Washington dates back to 1914, when the Daughters of the American Revolution requested a state flag from Washington so that it could be displayed in the country's capital. Washington did not have a state flag of its own at the time that they made the request, so the Daughters of the American Revolution organized a committee to design a new flag. 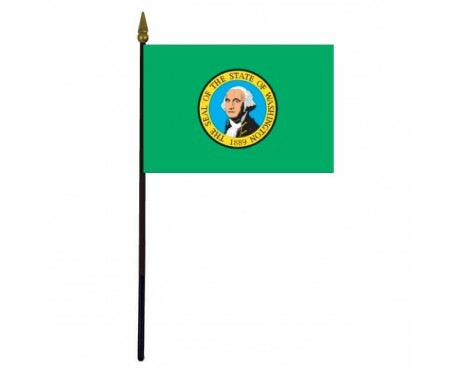 The organization used the flag for its own purposes shortly after it was designed, but the state of Washington did not formally adopt the flag for almost a decade. The state legislature finally voted to adopt the flag in 1923, at which point the bill that authorized the flag passed into law without being signed by the state's governor. The original description of the flag was not particularly specific, so several variant forms came into use. The details of the flag were finally standardized in 1967, which created the design that the state of Washington currently uses in order to represent itself and its people. Washington State did not adopt it's flag for more than 30 years after it's admission to the union. The seal was designed by the Talcott brothers (who were silversmiths). They chose a dark green field to represent the lush forests of the Evergreen State, and refers to the state's environmental concerns. The official seal of Washington State was placed in the center in honor of the nation's first president. 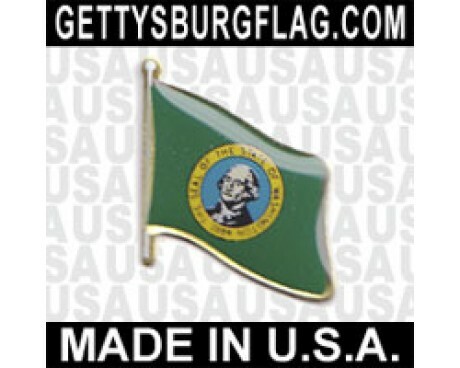 It is the only green state flag, and the only one to include an image of an actual person, and the citizens of Washington proclaim their intent to follow the guiding principles of honesty, sincerity, and devotion of the founding father.Their flag was adopted on March 5,1923. The state lies in the extreme north-west and is the nearest one to Alaska, it shares the Vancouver coastline with British Columbia and was part of the Oregon Country once shared by Britian and the USA. Became a Territory in 1853, and became the 42nd state on November 11,1889 and was named for the country's first president, George Washington. State Motto: Alki "Bye & Bye"